COMPETITION: Win a RoadHawk dash cam! Branded work vans are an easy target for “crash for cash” scam artists. Vehicle cameras – also known as dash cams – are a cost-effective way of protecting your business and your reputation. This guide from RoadHawk advises you on how to choose the right dash cam for your business. Part of the Trakm8 Group, RoadHawk is an established UK dash cam brands, and its customers have seen their at-fault accident rates fall by as much as 20%. In fact, cameras are so successful at reducing accident rates that many insurers are now offering discounts of up to 10% on premiums for companies which install dash cams. Installation options: Most dash cams are plug and play devices that can be installed in less than five minutes. However, a good supplier will also offer you a hard-wired solution and professional onsite installation. Scalable HD footage: High-quality images in 720-1080p ensure key data is captured, such as vehicle registration plates. G-Force sensor: When the G-Force sensor detects an impact, such as a collision or a harsh braking event, it will trigger the camera to record an “event file” on its SD card. It safely stores this file so that the camera’s loop recording functionality doesn’t overwrite it. G-Force and vehicle speed data can help to provide a clearer picture of the cause of a crash. Time-stamped footage: Footage must be time- and date-stamped for it to be submitted as evidence to the police or your insurer. Tamper-proof box: If you are worried about drivers tampering with the camera or its memory card, look for a supplier who can provide locking boxes around the cameras as an optional extra. Telematics trigger: If you do not wish to depend on drivers telling you when events have occurred, ensure that your camera can be linked to your telematics device. This will trigger an automatic email alert whenever an event takes place. Required recording times: An 8GB SD card may be sufficient for an average car driver; but a busy van is going to be creating much larger volumes of recordings. Ensure the camera can accommodate a decent memory card. Compliance: Ensure your camera comes with a vehicle sticker to ensure other motorists are aware you might be recording them. Aftersales support: Can you call on UK-based product support – and what level of warranty do you get? Trakm8, owner of the RoadHawk brand of dash cams, is giving you the chance to win a RoadHawk Vision Super HD Wi-Fi dash cam! 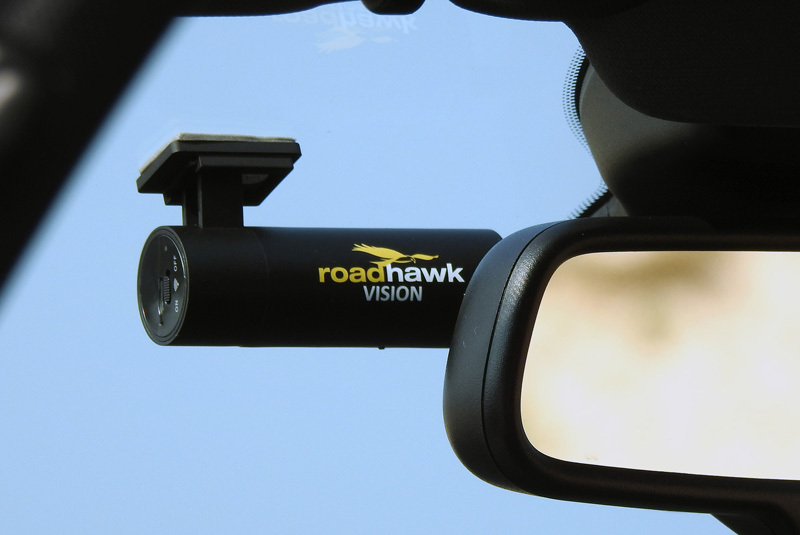 The RoadHawk Vision offers smartphone connectivity, making it easy to record and view unexpected road traffic events. With a quick and easy installation time and user-friendly app, the RoadHawk Vision is perfect for the first-time dash cam user.